Read the rest of this post on baby carrots (Michael Pollan calls them carrot bullets) on Green and Clean Mom! I always wondered why I couldn’t eat those baby carrots — they make my mouth feel like I am having an allergic reaction (I am allergic to tree nuts — so I know the feeling). Maybe this is why! No molly that is not why, and the reason is that this article is semi-fictional. The white blush has nothing whatsoever to do with chlorine, and echochildsplay should be ashamed of themself for posting fiction. The white blush is simply dehydration and is caused because the carrot is peeled. Baby carrots are not “deformed”, they are regular carrots that are cut into small pieces. The article that this post linked to has more information – perhaps next time read it? ecochildsplay – you should issue a retraction. Chlorine added to the water, just like tap water. This doesn’t mean that the carrots are dipped in bleach as your headline implies. This is another urban myth. 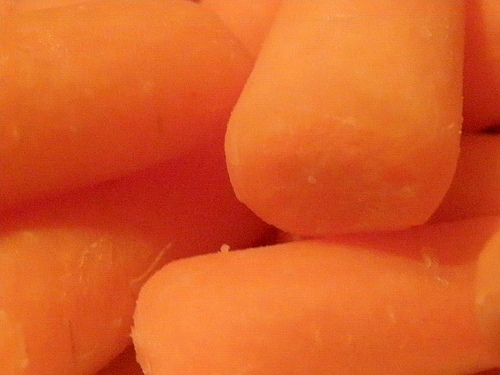 Some baby carrots are washed in a WEAK chlorine solution and then washed in clean water. This solution is perfectly safe and passed by the Dept of Agriculture. Anyone stupid enough to waste their money on “baby” carrots is stupid enough to believe this rubbish. Organic growers use Citrox a “safe” natural alternative. The answer? eat whole carrots or cut them up yourself. Why would anyone want a peeled carrot anyway,all the vitamin content has been removed and sold as beta carotene. Baby carrots aren’t even baby carrots, they are whats leftover from processing all the good out of the carrot. You would have to eat a whole bag to get the benifit of one carrot. If you want the benifits of eating veges, eat the peel. This ‘Chlorine’ each of you keep speaking of is most likely sodium hypochlorite also know as chlorine bleach. It is used a a disinfectant and antimicrobial in many industries. It is made by reacting a sodium hydroxide solution (also know as caustic soda or lye) with elemental chlorine gas. All of these chemicals are made from sodium chloride, also known as salt. Next time do some research. Look up cholera if you want a glimpse of what the world was like before the wide availability of chlorine disinfection. This post is an embarrassment to Eco Child’s Play. I sure hope Jennifer doesn’t figure out that chlorine is also in salt, she’ll have a fit when she does! A new webpage http://www.truthaboutbabycarrots.com is up and it dispels a lot of the myths surrounding carrots and chlorine. Interesting stuff.